Immediate payment of C $794.99 is required. Great value at 400. Punchy bass. Rough audio balance. Good, but not good enough to justify the cost. The sound is very good, but even after the firmware update and software adjustments through the android app and remote the center channel is still weak during DVD (blu-ray or 4K) playback. I have the center channel adjusted up to the maximum of 6 and still dialog is weak. Dolby Atmos is adequate but not as pronounced as I had hoped it would be. But for the cost of the bar it should be better than it is. Subwoofer is good too but could be much better, even after adjusting it to the maximum setting. The build quality is excellent. I also purchased the LG wireless rear speakers which helps the surround. Without them it would not be a good theatrical experience. I’ve had this sound bar for about a month now & I love it ! This is the first sound bar I’ve ever bought. It sounds amazing. It has different sound modes or you edit the sound options to what you prefer ( make sure you update it over Wi-Fi ). The only problem I have with it is I don’t know have to activate Dolby atmos on it. I don’t know if that happens automatically or it’s a setting for it. Maybe I’m don’t have it hooked up right using HDMI ARC. I’m still learning & need to figure that out. Will update my review once that happens. Loving it so far though. 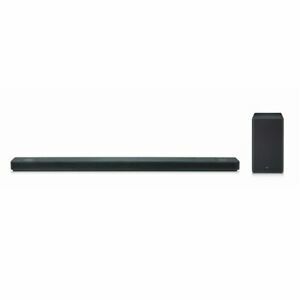 Awesome Soundbar, Great Price! Have it paired with Vizio 65 p series TV. If you purchase which I strongly recommend, get the firmware update immediately. Only use LG WI-FI Speaker App. It's very easy to Update! !